Fortunately, Bernie Sanders has been getting a lot of air time recently. 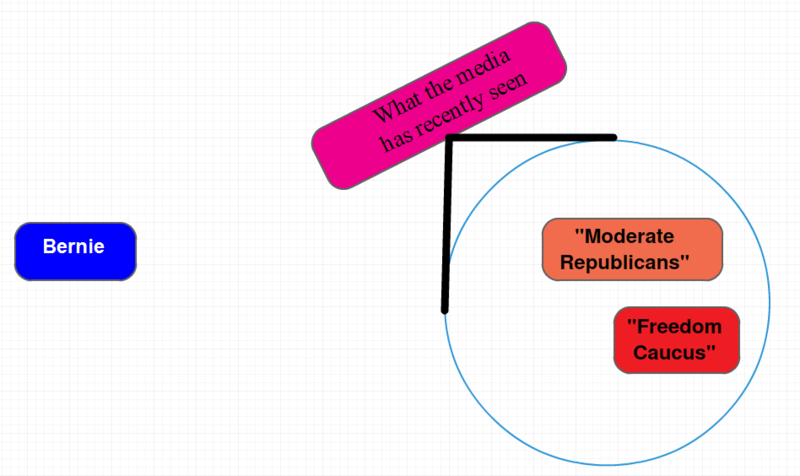 For the most part, the peripheral vision of the media has ranged from about 85o right (about as far out as the “Freedom Caucus” can go) to around 45o right (about as far to the left as so-called moderate Republicans go. An observer of the way in which the recent health care debate has been covered might think that Obamacare came from sinister heartless characters called Democrats. Much of the media presents the story as if the only good ideas on what to do about health care is in the domain of the Republicans. The range of options lie between the “mainstream” Trump-Ryan “coalition” and the so-called “Freedom Caucus.” While we congratulate the media for openly talking about the fake governing by the Trump Administration, the media is still falling short in explaining our real options with health care. One of the reasons why Obamacare has been such a punching bag is that it is a 2,000-page bill made of compromises, designed to offer something to almost every Democrats and quite a few Republicans. The people who like Obamacare still don’t love it. The law is amorphous, undefinable and bulky. But to its credit, it has provided health care coverage to tens of millions of Americans who otherwise wouldn’t have it. Additionally, and we know this drill well, it has allowed children to stay on their parents’ policies until they are twenty-six, it has outlawed insurance companies from rejecting coverage due to pre-existing conditions, it has eliminated life-time limits, and it has provided hope to many where little existed. What America needs to hear now is that Obamacare can be so much better, and essentially none of the ideas suggested by Republicans bring any help to anyone who is either sick or not a millionaire. To a compassionate person, there is hardly a dime’s worth of difference between the Trump-Ryan proposal and that of the “Freedom Caucus.” The discussion must move away from “repeal and replace” and focus on “reform and repair.” And where can that be done? Within the Democratic Party. And where within the Democratic Party? With progressives, who know the wisdom of Medicare-for-all / a Single-Payer system as designed in H.R. 676, introduced years ago by Dennis Kucinich, John Conyers and other logical visionaries. And who among the progressives can be our leaders? Well that’s obvious. Bernie Sanders has staked out that position for nearly eighteen months. He is both unapologetic and modest. He is reasonable and empathetic. He is virtually everything, except being young. Elizabeth Warren has been carrying a lot of the water lately Former Michigan Governor Jennifer Granholm has been precise with her calls for compassion and efficiency in her role as a commentator on CNN. She accurately renamed the “Freedom Caucus” the Callous Caucus. She poignantly stated that when we discuss health care, we need to drop the tax breaks for the wealthy and instead provide affordable universal care through Medicare-for-All. The GOP plans have been designed to keep the parasitic health care industry profitable. Many of the six hundred thousand or so people who work in the industry may be fine people, but that is no reason for the industry to continue to exist, any more than we need horse-drawn carriages. We need to address what to do about the 600,000 people in the health care industry as we do with what to do about the 174,000 coal miners in America. In both cases, we need to recognize the structural changes that have occurred in the American economy. We need to help people move to jobs that are growing and are necessary; not those that are dying and increasingly irrelevant. Both the media and the Democratic Party need to know that the most important voices on the left to hear are those of progressives. This requires both the media and the Party to be looking for progressives, but more importantly for progressives to make themselves more visible. Bernie has paved the path. Now the rest of us can do justice to both his work and his vision.